The African Cruise Company has two vessels; the impressive African Queen, a triple deck 70 foot catamaran and the slightly smaller, but equally luxurious African Princess. 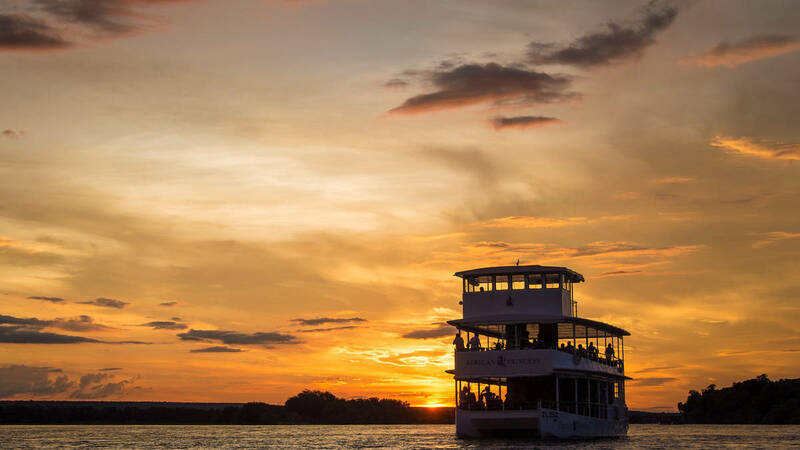 Both offer the charming combination of the mighty Zambezi River and gracious hospitality; unforgettable experiences that will take you back to an era when time stood still. WhenThroughout the year, subject to availability. WhereThe cruise departs from and returns to the Royal Landing on the water's edge. WeatherFair weather, the cruise may be delayed should there be a thunderstorm, or heavy rain. Guests or SpectatorsVisitors not joining the cruise are welcome to browse the curio shop at the Royal Landing, or purchase refreshments while waiting for the cruise to return. Return road transfers from accommodation venues in the Livingstone area. Her Royal Highness Be Dyango XVIII of the Leya, the patroness of the African Queen Cruise Company, welcomes you to the African Queen River Experience.